Fun Jingle Bell Bracelet with Glitter or Jewel-Tone Beads - Really Jingles! Funky Christmas Novelty Holiday Costume Jewelry. Over 20- GOLD or SILVER Color Small Size 3/8-inch (0.94cm) Jingle Bells between Clear Translucent GLITTER or JEWEL-TONE acrylic pony beads. *Choose your bead and bell color! Adult size stretch bracelet. 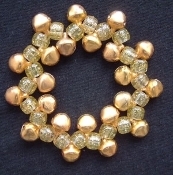 *GOLD GLITTER Beads with GOLD Color Bells Pictured. GOLD or SILVER Jingle Bells? * Select GOLD-tone Jingle Bells SILVER-tone Jingle Bells?